Update (12.05.07) - Updated the plugin to YUI Version 2.4.0. Fixed a couple of bugs and switched the comment editor over to the new SimpleEditor (for lighter pages), also minimized all internal JS scripts as well. Update (09.25.07) - Updated the plugin to YUI Version 2.3.1. Fixed a couple of bugs and added support for not rendering the Editor if a highend mobile phone is detected. Note: This plugin has only been tested on Wordpress versions 2.0.3 and 2.1. Please be nice with the posts and the comments or I will have to turn off the demo. 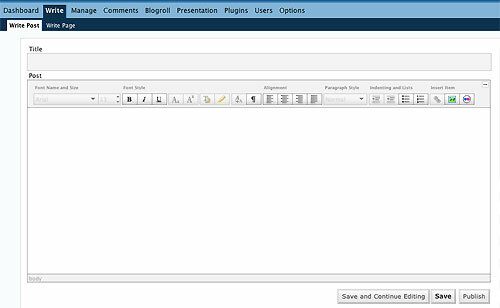 Now, log into your blog and click on the Plugins tab. Click the Activate link next to the newly installed plugin. Now click on the Users tab. Check the box next to "Use the visual rich editor when writing" on this page. You should now have the new YUI Rich Text Editor when you write a post. By Default WordPress is a little strict on their allowed HTML. To fix this, add the following PHP to the bottom of your wp-config.php file. 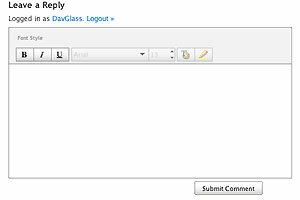 Click on the Plugin tab, then click on Plugin Editor. Now click on the WP YUI Rich Text Editor link on the right side of the page.